Oregano Oil naturally contains 85% carvacrol. Nature's Way uses a patented formula to deliver the many benefits associated with its use. Directions: Adults take 1 capsule a day. Other Ingredients: Lecithin, hydroxypropyl methylcellulose, flaxseed oil. Warning: May cause stomach upset. Do not use if you have hypersensitivity or are allergic to herbs in the Lamiaceae family such as basil, hyssop, lavender, perilla, mint, rosemary, sage and thyme. Discontinue use if you experience gastro-intestinal upset. Contra-Indications: Do not use if you are pregnant or breastfeeding or if you have any illness of the kidneys or liver. Known Adverse Reactions: Hypersensitivity can occur if you are allergic to plants of the Laminaceae family such as basil, lavender, marjoram, etc. 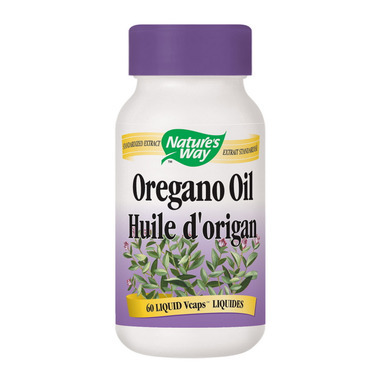 I use these oregano oil capsules for over a year now (bought it three times so far). My whole family, including grandparents, take it if they are getting sick with cold and it worked every time. We take it together with Nova Scotia Organics Chewable Vitamin C, which is great too. I used this Oil of Oregano on a whim because i was getting sick and the brand i normally use (Webber) was out of stock. I didn't find this has helped my cold at all. Will go back to using my old faithful.